February 19, 2010 - Garmin announced the G500H, an all-glass avionics system designed specifically for the VFR Part 27 helicopter market. The G500H is a derivative of the G600 and G500 for the fixed-wing market, yet the G500H has been optimized for rotorcraft and offers features like helicopter synthetic vision technology, helicopter-specific databases with over 7,000 heliports and nearly 30,000 additional low-altitude obstacles, XM WX Satellite Weather with NEXRAD, and the ability to display video from a forward looking infrared (FLIR) camera or other video sources. The bezel framing the G500H’s primary flight display (PFD) and multi-function display (MFD) (10”w x 6.7”h) allows for easy installation into the instrument panel. The G500H system includes a solid state Attitude and Heading Reference System (AHRS) for superior reliability and accuracy. Garmin’s AHRS features rapid alignment while moving, including in-flight dynamic restarts. The G500H is available in two versions – one with the PFD on the right, the other version with the PFD on the left – allowing maximum installation versatility. The PFD screen displays attitude, airspeed, vertical speed, altitude and course/heading information, and the MFD shows detailed moving map graphics with the helicopter’s current position in relation to terrain, chart data, navaids, and flight plan routings. The G500H communicates and integrates with Garmin’s other panel mount products, such as the GNS 430W/530W series. In addition to the intrinsic benefits of WAAS approaches, Garmin has also developed a special helicopter navigation database that lets operators easily navigate to over 7,000 heliports, without having to create user waypoints at those locations. The G500H also supports Garmin’s helicopter-specific synthetic vision technology (HSVT). By adding Garmin’s HSVT to the G500H, the PFD will display an “out-the-window” view of the surroundings, regardless of the weather conditions. HSVT seamlessly blends information about the rotorcraft’s position with topographic databases to create and display real-time 3D images. Land, water and sky are clearly differentiated with shading and textures that are similar to the topographical colors found on the MFD moving map. HSVT alerts pilots of potential ground hazards by displaying terrain and obstacles which pose a threat to the aircraft. Recognizing the importance of keeping track of personnel and mobile assets, the G500H is also compatible with Garmin’s new GSR 56 Iridium transceiver, an affordable worldwide position tracking solution that enables aircraft location data to be monitored via web-based displays on authorized base-ops computers. The Iridium network provides seamless global coverage and enables the GSR 56 to transmit a helicopter’s position and flight track from anywhere in the world. Near real-time weather is also available as an option via XM WX Satellite Weather (U.S. and Canada only) and Garmin’s GDL 69. Customers who equip their helicopter with the GDL 69 will receive graphical weather depictions of NEXRAD, METARs, TAFs, TFRs, winds aloft, echo tops, precipitation type at the surface, lightning strikes, storm-cell data, AIRMETs, and SIGMETs. The weather data may be laid directly over navigation and topographic map databases. With the optional GDL 69A, pilots will also have access to more than 170 channels of XM audio. Weather and music requires an XM subscription. Customers may interface the G500H with Garmin’s TAS and TCAS I traffic systems, the GTS 800, GTS 820 and GTS 850, which are optional equipment. The Garmin traffic systems combine active and passive surveillance data to pinpoint specific traffic threats. The systems use Garmin’s patent-pending CLEAR CAS technology and correlates automatic dependent surveillance broadcast (ADS-B) with radar targets to provide pilots with the most accurate picture of the sky. The G500H includes SafeTaxi, which features detailed diagrams of over 900 airports that assist pilots while maneuvering in the airport environment. A trial version of Garmin FliteCharts is included, which allows pilots to quickly find and view airport diagrams on the MFD. Pilots may also select the optional ChartView, an electronic version of Jeppesen’s extensive library of charts and airport diagrams. The G500H will be on display for the first time at Heli-Expo, February 21-23, 2010, and show attendees can view the new system at Garmin’s booth and static display. In addition, Bell Helicopter will have a Bell 407 on display with a G500H that was installed by Edwards and Associates, and Eurocopter will have an EC 130B4 on display with a G500H that was installed by Air Methods Product Division. Garmin expects to receive the FAA’s Supplemental Type Certification (STC) for installation of the G500H into the Bell 206 and Bell 407 in the second quarter of 2010. The G500H is expected to be available for an introductory price of $24,995. The G500H includes the GDU 620R display/control unit, GRS 77H AHRS, GDC 74H digital air data computer, GMU 44 tri-axial magnetometer, and GTP 59 temp probe. 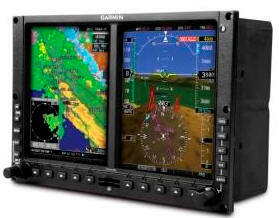 Garmin’s HSVT is expected to be available as a G500H option for $7,995.